The ground was opened in 1998, after the Club moved from its old Bayview ground. It currently has only one stand, which sits at one side of the pitch. However the stand is of a fair size, is covered and all seated. The space & height between rows is adequate, giving fans a good view of the action. 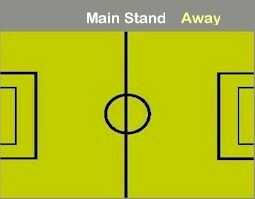 Away fans are located in the North part of the Main Stand, where up to 1,000 can be accommodated. The facilities in this stand, as you would expect from a new ground are good, with even the stadium music and announcer piped through to the toilets! The ground is right on the coast and at times a biting wind can come off the North Sea so make sure that you wrap up well. On the down side, though, I would have to say that the outlook from this stand over the back of the ground has to be one of the ugliest I have seen at a football ground, with some huge old power station sitting beyond the grounds' perimeter. There is a social club above the Main Stand, which welcomes away fans. It is quite a comfortable club, which enjoys views across the ground. The ground is quite easy to find as it is situated on the sea front and is quite visible from a distance. From Kirkcaldy take the A911 towards Methil and then the A915 to Leven. Then turn right onto the A955 towards Leven & Methil. Follow the A955 through Methil towards Buckhaven. As you go along the sea front, the ground should be visible over to your left. Turn left onto the B932 (South Street) and then left again into Harbour View Road. The ground is down the bottom of this road on the left. There is a fair sized car park at the ground. There is no railway station in Methil itself. The nearest is in Kirkcaldy which is around eight miles away. John Thompson adds; 'On Saturdays' there is an excellent X26 bus service from Kirkcaldy to nearby Leven leaving Kirckaldy about every 30 minutes and goes to Leven Bus station which is about 10 minutes walk from Bayview, on the other side of the old Methil Power Station. After the game there was a 17:15 X26 leaving from Leven bus station which was made no problem allowing me good time back at Kirkcaldy , that X26 actually goes back to Glasgow via Dunfermline'. Adults - �9, Concessions �5 (Under 15's/Over 65's). Family Ticket - 1 Adult + 1 Child �12, 2 Adults + 2 Children �15. For the East Fife fixture list click here (to take you to the BBC Sports Website). Division One, January 2nd, 1950. If you require hotel accommodation in the area then first try a hotel booking service provided by Football Hotels who are powered by Activehotels, who specialise in locating accommodation near or within a short travelling distance of the football ground. They also have the added advantage over some other hotel booking services that you pay on departure. Yes this site will earn a small commission if you book through them, but it will go to help with the running costs of keeping the Guide going. To access their East Fife page click here.